The Berduo family speaks with authorities as they try to cross the international bridge between Matamoros, Mexico, and Brownsville, Texas. Wayner Berduo's eye socket was mangled by a bullet. His father says a drug lord sent two assassins to kill his sons one day last December in Guatemala. Six of the nine members of the Berduo family from Guatemala. The ages range from 58 years to nine months. 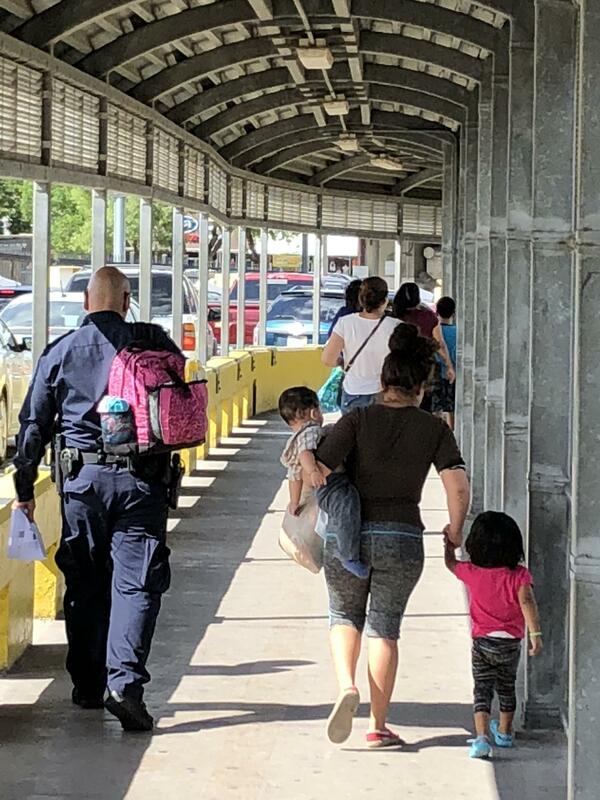 Victor Berduo's daughter-in-law, Yeni Johary Leal Cruz and her two small children are escorted by an agent as they cross the bridge into Brownsville, Texas. They were the only family members to enter America. 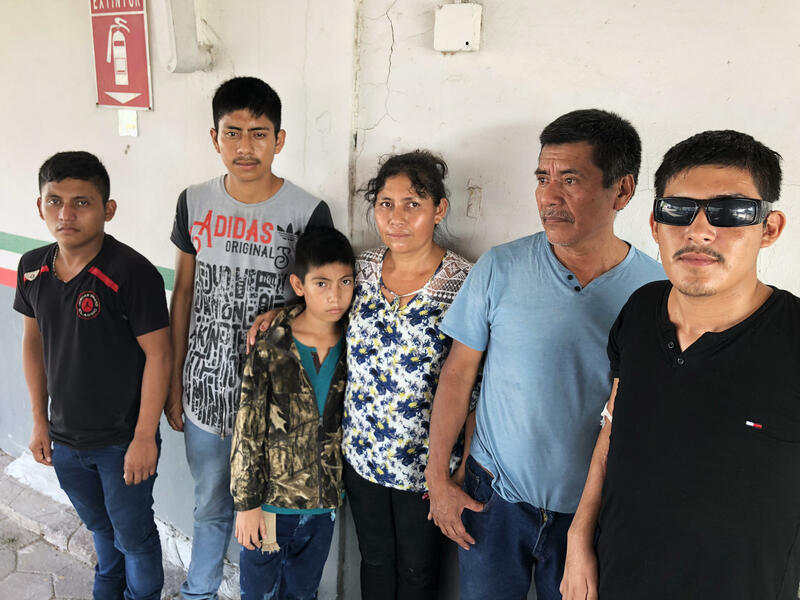 The Berduo family traveled nearly 2,000 miles from Guatemala to the international bridge between Matamoros, Mexico, and Brownsville, Texas, but they could go no further. Under a new policy, federal border agents stationed in the middle of international bridges are turning away asylum seekers like the Berduos, telling them there is no room in U.S. Customs and Border Protection stations for them. Since arriving on Monday, the family said they had tried three times to cross into the U.S., and three times border agents turned them back. On Tuesday, the nine family members, who range in age from 58 years to nine months, sat glumly at a picnic table on the Mexican side of the bridge. "We've been here on the border for two days asking for asylum, but the U.S. government won't pay attention to us," said Victor Samuel Berduo, the family patriarch, with an expression of resigned exasperation. "They tell us to wait or go to a different bridge. But we don't know any other bridges." Immigrant advocates say these are the latest victims of White House policies meant to discourage asylum seekers from coming to the nation's borders to ask for protection. Up and down the southwest border, courtrooms are packed with immigrants arrested for unlawful entry. Youth shelters are filling up with immigrant children. Migrants are worried because Attorney General Jeff Sessions has sharply curtailed which cases qualify for asylum. And now, border agents have begun turning away asylum seekers at ports of entry, telling them to come back another time. That leaves some immigrants, like the Berduos, in limbo. "If we go back home," Berduo said, "they will kill us." Then, in a gruesome show and tell, he presented his 23-year-old son, Wayner. 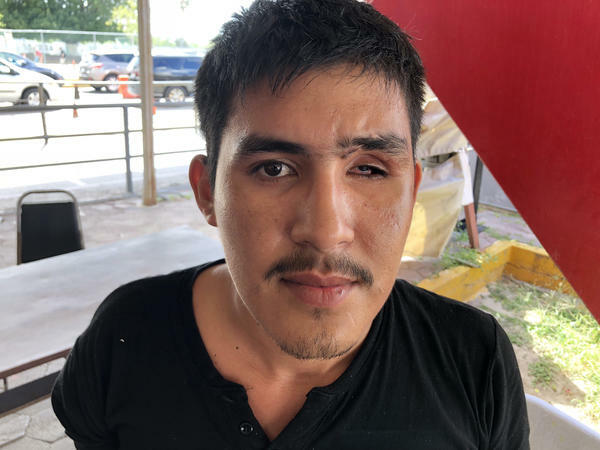 He removed sunglasses to reveal a left eye socket mangled by a bullet, and he pulled away a towel to show an ugly scar that zigzags up the length of his right arm, the result of four more bullets. His father said a drug lord sent two assassins to kill his sons one day last December. As Victor explained it, his boys made a living taking tourists to a place called the Blue Waterfall in the Peten province of northern Guatemala. But the narco owns the property and doesn't like visitors. Berduo's wife, Estafania, opens a plastic bag containing a stack of papers, the documentation they will use to back up their plea for asylum. One document, that bears an official-looking stamp and a signature from a local judge, affirms the family is a victim of "real threats" and urges any "civil, military or diplomatic" authority in a receiving country to allow them "to live peacefully." Customs and Border Protection, which is in charge of the nation's border crossings, says it is overwhelmed with asylum seekers fleeing domestic abuse and gang violence in Central America. Statistics show a 58 percent jump in families and a 14 percent increase in unaccompanied children asking for protection at ports of entry this year compared to last year. 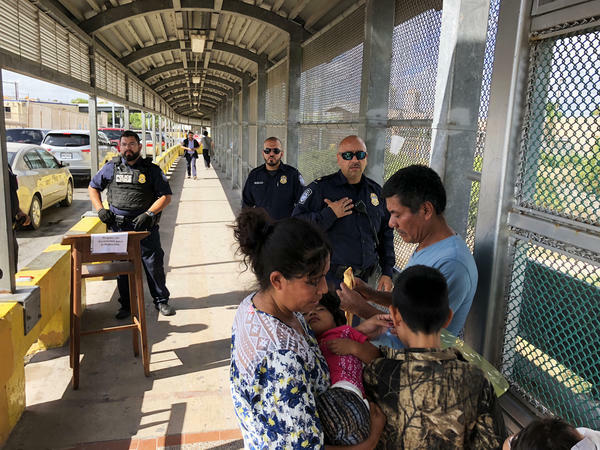 Agents have been posted in the middle of pedestrian bridges across the U.S.-Mexico border to check documents and turn away applicants. "No one is being denied the opportunity to make a claim of credible fear or seek asylum. CBP officers allow more people into our facilities for processing once space becomes available," the agency says in a statement. Immigrant advocates say this is just the latest obstacle for asylum seekers under the Trump administration. Under a new "zero tolerance" policy announced last month, immigrants who cross the border illegally will be prosecuted, even if they are seeking asylum, and they may have their children taken away and sent to government-contracted shelters. Then, earlier this week, Sessions narrowed the path to asylum and said domestic abuse would no longer be accepted as a valid claim. Christina Patiño Houle, director of the Rio Grande Valley Equal Voice Network, says the administration is giving a mixed message. Federal officials are telling asylum applicants to stop wading across the river and entering unlawfully. Rather, they should come through an official port of entry. "A message is being broadcast across the nation that migrants should be seeking asylum through official channels, and it's just not possible," Patiño Houle says. "What we're seeing on the ground is that people are being turned away. They're being told that either there's no room or they cannot enter the bridge." U.S. officials say there may be a holdup at some bridges but that, ultimately, immigrants who wait a matter of hours or days are permitted to enter. "Port of Entry facilities were not designed to hold hundreds of people at a time who may be seeking asylum," CBP says in its statement. But there are not hundreds of migrants a day trying to cross the Matamoros/Brownsville bridge, according to Mexican officials interviewed on the Matamoros side. They estimate only 10 to 15 asylum seekers show up a day, and they're surprised that U.S. agents are saying there's no room in their station. Late Tuesday, the Berduo family decided to try again. They pick up their bags and troop up the concrete walkway that spans the murky, sluggish Rio Grande. Two immigration agents sweating in dark blue uniforms await them at the top of the bridge. "Did you bring documents to enter?" one of them asks. Victor Berduo answers, "We are asking for asylum because we cannot return to Guatemala." The officers frown and call a supervisor when they see a reporter with a microphone accompanying the Guatemalan family. The supervisor is bald and wears sunglasses. He examines their papers and passports. He tells the reporter to stop recording. "You can either stop or we won't do anything," he says. The reporter answers that he is on the Mexican side of the international boundary. "It doesn't matter," the supervisor replies. "I'm actually trying to help them." Another agent gets a call on his radio: "We have room for one family." The agent tells the Berduos family they will only accept three people: their daughter-in-law, Yeni Johary Leal Cruz, and her two small children. The six remaining family members will have to return to Mexico and wait. On this sweltering afternoon, American tourists are passing by on the bridge walkway, carrying bottles of tequila and pictures of Pancho Villa, and looking on quizzically as an anxious family conversation ensues. "We can't do it. We're one family. She always goes with us," says an anguished Estefania. The agents are adamant: They will only take three. Finally, the family relents. The 20-year-old daughter-in-law, her eyes brimming with tears, collects her children, a nine-month-old and a two-year-old. The agent shoulders her pink backpack and escorts her into America. The rest of the family walks back down the concrete bridge to the picnic area on the south side of the river to wait some more. "Tomorrow I hope they'll attend us and our family can be complete again," says Victor Berduo, hopefully. "This is what we want."